In this viral new story over at American Military News they report that the National Football League had previously denied requests made by the Dallas Cowboys to honor 5 murdered police officers who had been ambushed back in 2016, this while the NFL hasn't come out and said anything critical regarding players who are kneeling or sitting during the national anthem in protest. Just the latest evidence that today's NFL isn't anything like the NFL that Americans grew up with, seen also in their rapidly declining ratings, it's been obvious to those paying attention that the NFL long ago shifted away from their 'all-American, family-friendly' game as is most-evidenced in their now-infamous 'satanic' halftime shows full of illuminati symbolism that appear to be run by satan himself. Also taking on a pro-gay, anti-Jesus and anti-2nd Amendment stance over the past several years, we really shouldn't be surprised that the NFL has now gone all-in on being anti-America with their allowing the disrespect of our national flag, US Veterans nationwide and our very country by those making millions of dollars every year to play a kids game. 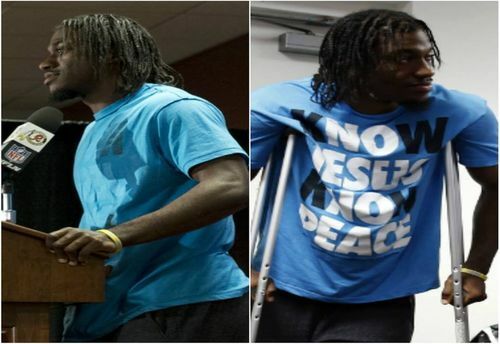 Back in September of 2014, former Washington Redskin quarterback Robert Griffin III (also known as RGIII) was told by the NFL to turn his "Know Jesus Know Peace" t-shirt inside out prior to doing a press conference as seen in the photograph above. Why would the NFL ban Jesus but allow players to disrespect the American flag and our nation? The dark road that the NFL has followed over the past decade+ was urged on in this 2015 story over at The Nation titled "Getting God Out Of Football" yet as we read in several different stories from Vigilant Citizen and see in the first 4 videos below, the NFL has also gone all-in and allowed satanic symbolism to proliferate in their 'illuminati-inspired' super bowl halftime shows going back many years. Back in 2014, another NFL star was abruptly cut off by CNN while sharing his faith in Jesus. NFL player Benjamin Watson was abruptly cut off while addressing CNN anchor Brooke Baldwin during a segment about the volatile situation in Ferguson, Missouri. Watson began to share his faith saying the situation was a, “sin” problem, not a “skin” problem.” And everybody knows about the struggles that devoted Christian Tim Tebow went through in the NFL. Why do the NFL and the mainstream media share such a hatred of God, Jesus and America? As we see in the final video below, a flashback republished today from David Knight over at Infowars, the league of billionaires is the eager partner of the Federal government in the social engineering of a police state, partnering with the TSA to commit personal fouls, encroachment, blocking below the waist, and illegal forward passes — all committed against their loyal fans— helpless spectators and passive couch potatoes, mesmerized by spectacle while they're being robbed of their money and their rights by 32 of the wealthiest families in America. Millionaires playing a kids game, NFL stars making more money in a day than many Americans will see in their lifetimes protesting against the very country that has allowed them to achieve such a status borders on the edge of insanity. Why won't more of these millionaires put their money where their mouths are and fund more programs to help the inner cities, where most of the violence against blacks begins, and overwhelmingly at the hands of their own race? And remember, these 'protests' began last year while Barack Obama, the divider in chief, was still president. Need more be said? 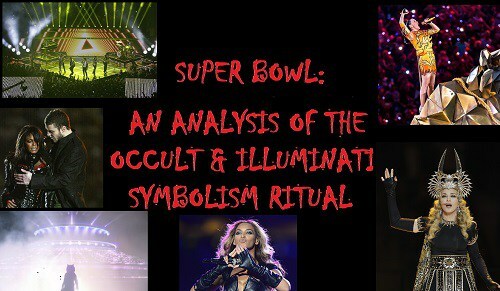 From Lady Gaga in 2017 to Beyonce and Bruno Mars in 2016 to Katy Perry in 2015 to Bruno Mars again in 2014 to Beyonce again in 2013 and Madonna in 2012, super bowl halftime shows of recent years have been full of satanic, illuminati symbolism and imagery as Mark Dice and other videographers steadfastly document for us in their viral videos below. Besides the game of football itself; most viewers tune in for the commercials and the illustrious Super Bowl Halftime Show. Artists are used by the Illuminati due to their natural ability to get their minds into another realm. This altered state is similar to the ones utilized by ceremonial magicians to contact extraterrestrial entities. 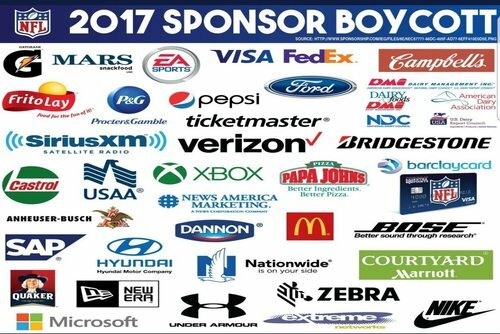 With US patriots now backing President Donald Trump en masse by launching an all-out war against the NFL that includes deserting the teams games in droves, burning tickets, jerseys and other team gear and now launching a boycott of NFL sponsors as seen in the list above and reported in this Change.org petition, we're not the least bit surprised that the mainstream news media is still attempting to spin Sunday as a 'win' for the NFL, despite the masses letting their opinions be known. Proving to us that they have NO IDEA who their 'fan base' is, it's been reported that NFL watchers WERE overwhelmingly President Trump supporters including Christians, members of the military and other conservatives. So why has the NFL launched what amounts to a war against some of their staunchest supporters along with attacking God and America? We believe that it all comes back to the NFL rejecting the rights of their own players to speak about God, Jesus and their own faiths, proving to us beyond a shadow of a doubt that they really could care less about the 'freedom of speech' of their Christian or conservative players but will spinelessly cave-in in an instant flat to 'political correctness'. These videos prove the NFL has accepted illuminati satanism while abandoning God and America. Thanks to Steve Quayle for coining the title of this story: "When Satan Became The Halftime Director Of The NF-Hell".